Chris Gibbons of Eagle Mountain receives his Apple TV from Brenda Swift of Direct Communications . Chris Gibbons became the first lucky winner of Direct Communications monthly facebook fan contest in Eagle Mountain. The prize for February was a new Apple TV media player. To win the prize for February, facebook fans of Direct Communications had to answer the question: “What was the price Direct Communications paid the City to purchase Eagle Mountain Telecom back in 2006?” (Official answer- $6.3 million) The first customer to reply to the post with the correct answer in the comment field was chosen as the winner. The goal with these monthly giveaways is to encourage participation on our facebook page, and also try motivate more customers to sign up as facebook fans. Each month during 2011, we will be awarding a prize to a customer on facebook, both in Idaho and Utah. We now have separate facebook pages for Idaho and Utah customers so that we can be more relevant with our updates and responses. 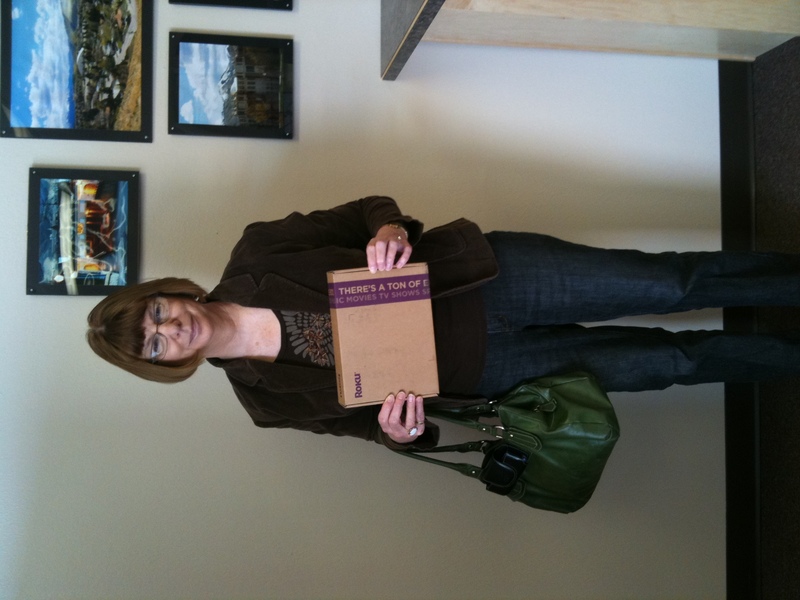 Kathy Barkdull of Idaho--winner of our Idaho February facebook contest, with her new ROKU streaming media player. She will be watching online video in style. As marketing director of Direct Communications, I am excited about these new social media tools like facebook, which are a very useful way to communicate with our customers. Not only is it instantaneous, but also interactive, which is really a revolution for mass communications. I also like the fact that customers opt into this communication–they are pulling a feed from us because they want to keep up to date with their service, instead of us just pushing out information into cyberspace blindly. We clearly need and want more customers as facebook fans. Our Eagle Mountain customers are extremely active, involved customers. They like to be part of the service process and want to know what their ISP is doing. One new use for facebook has been the ability to notify customers of internet outages, and the progress of fixes in real time, even while the customers’ home internet service was down. Most of our customers already have smart phones, often with a facebook app installed, and many have used that mobile connection to voice their opinions and suggestions during outages. This interactive process has resulted in some improvements in how we notify customers. For example, several customers on facebook asked for a more effective notification of scheduled nighttime maintenance outages, because they were working nightshift remotely using their internet. As a result of this feedback, we started a scheduled outages mailing list that people who needed to know could subscribe to. Social media is simply proving a long-standing concept of marketing, that the more touch points and open lines of communication you have with your customers, the better off your operation will be in the long run. So, if anyone else is looking to do a quick-response contest on facebook—consider these factors and suggestions—it’s not an exact science, and we probably won’t try a quick-draw contest again. We currently have a little over 600 facebook fans on our corporate fan pages. Considering how connected and tech savvy our customers in that market are, we would like to have a lot more, because most of our customers probably have active facebook accounts. Like us on facebook at http://www.facebook.com/directcom.eaglemtn for your chance to win next month. Only current customers are eligible to win, and only customers who are facebook fans of directcom will be able to post comments, so join our community. 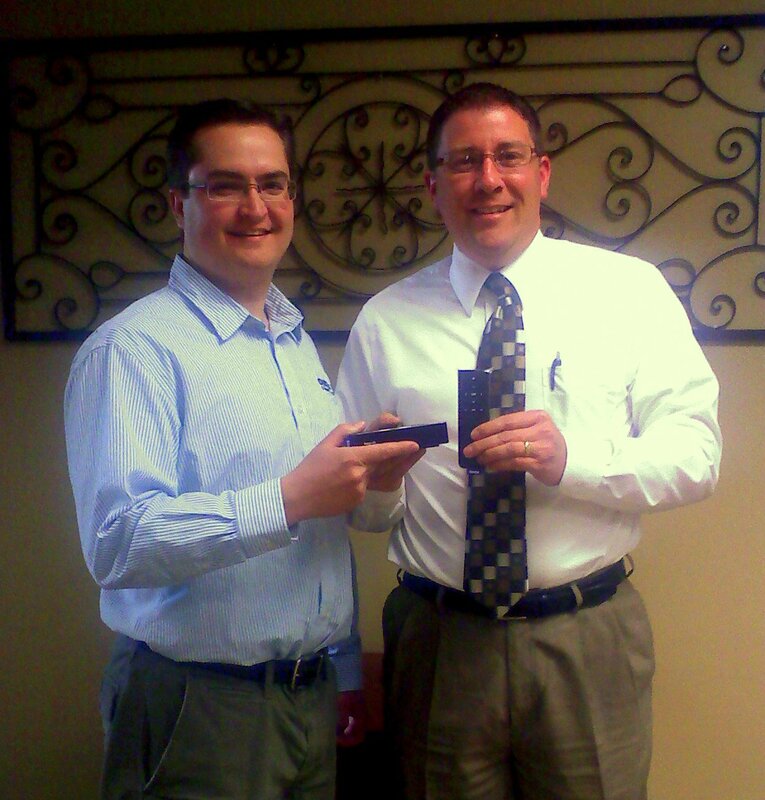 Congratulations to Todd Ferreira, the winner of March's Roku. I chose and keep choosing Direct Communications because of their seamless stream ability. We are always streaming Netflix or Hulu and have never had a problem with bandwidth or buffering. Sometimes my girl is watching something on my iPod Touch and my wife is watching something different on the laptop and it works great. We’ve never had any problems. I use Direct Communications because the sound is crystal clear through the phone. I never have to worry about losing internet or phone service even when the wind blows so strong here. My family loves playing online games and streaming video through our xbox. I couldn’t ask for a better service than Direct Communications. I chose Direct Communications because after 6 months of dealing with [wireless ISP] and their dropped calls, dropped Internet, phone calls cutting out, and terrible technical support, I was fed up. Since switching from [wireless ISP] to Direct Communications the phone calls are crystal clear, the Internet is lightning fast ( even at 3mbs) and the support group at Direct Communications is GREAT! Thanks for the service. Again, this was a difficult month to choose a winner, so we turned it over to a marketing committee for a vote, and they choose Todd Ferreira as the winner of March’s Roku for his comment. 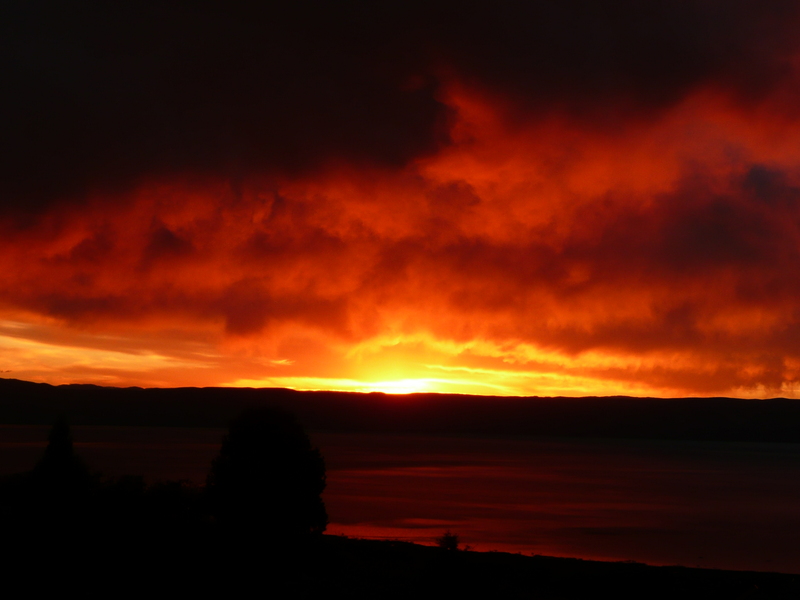 Sandra Allen-early morning sunrise over Bear Lake, from my front yard. In April we asked customers to submit original photos of the local scenery or community for our annual phone directory publication, but didn’t receive any submissions from Eagle Mountain customers that met with the qualifications needed for print purposes. However, on our Idaho fan page, we carried the competition over two months–April and May, and received several good pictures from residents in our phone exchanges. We chose Sandra Allen as the winner of our Idaho May facebook customer contest, for her original photo submissions of scenes around Bear Lake. Congratulations to April Butterfield Simister--the winner of our May Facebook fan contest. 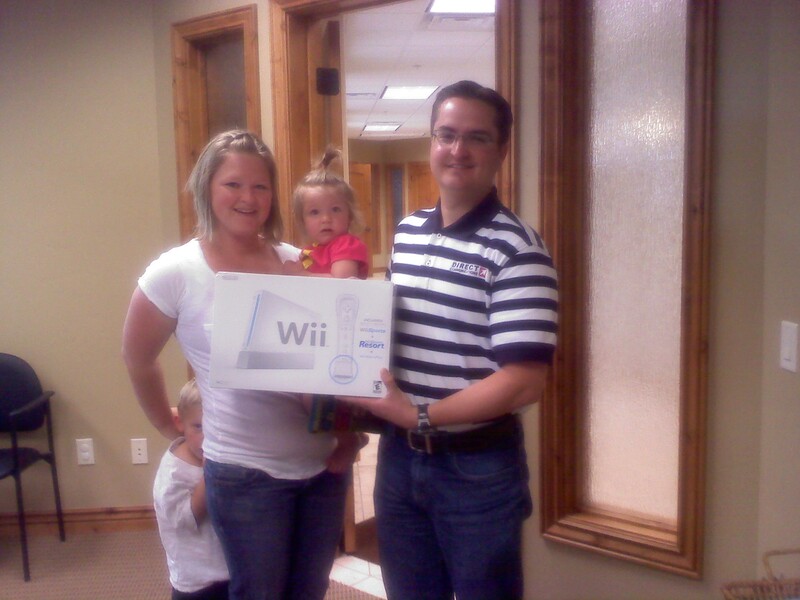 Ben Hayes presents April with her Wii for referring the most friends to our Facebook page. The winner, April Simister, referred 44 friends, the runner up, 34 friends. That month we added nearly 100 new fans to our page, which was our most successful monthly contest to date.